It’s deeply ironic to give you a recipe for “no-recipe” anything. We’ll fall back on our Pirates of the Caribbean model: really more like guidelines. These measurements are just meant to get you started. As part of my new low-carb, high protein lifestyle, I need breakfasts that aren’t cereal. I also prefer breakfasts that travel well, since I still have trouble giving myself enough time to eat in the morning, let alone cook. Enter quiche! I wanted to adjust a couple of things. One is that I tend to think quiches are too eggy, which I don’t like at all. The other is that the usual crust has more carbs than I wanted. While the carbs per serving aren’t that bad, it did get me thinking about something else I’d been wanting to try: a potato crust. 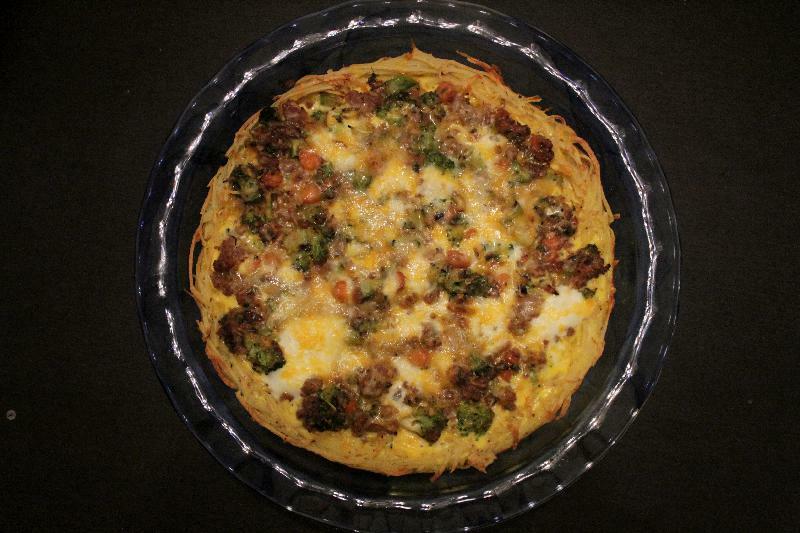 I then filled it with sausage and veggies, just enough egg to hold it all together, and topped it with browned cheese. Now that’s my kind of quiche. Here’s where the “no-recipe” comes in. 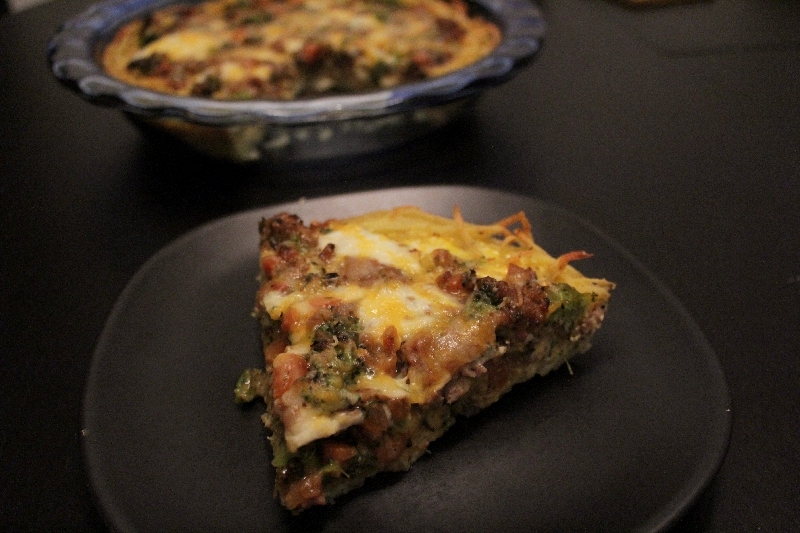 I used what I think is a deep dish pan, 9.5″ across and 1.5″ deep. 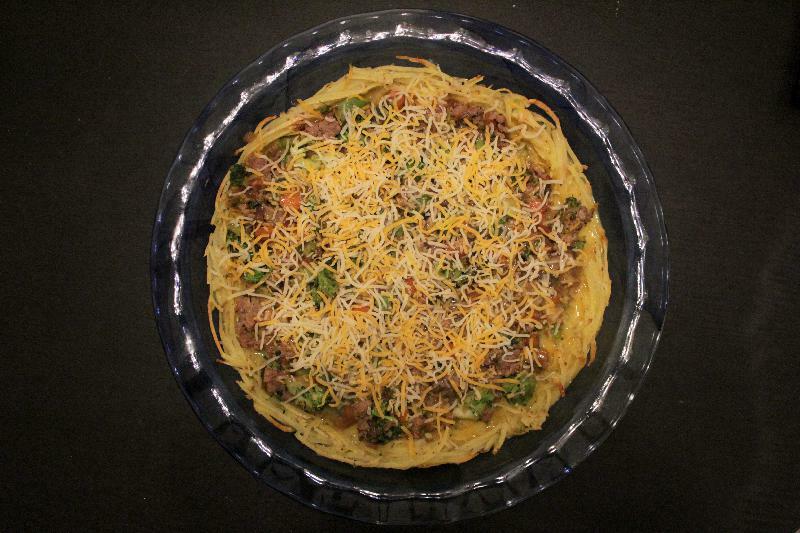 The filling is roughly 1/3 pound of meat, 3 cups vegetables, and 1 cup cheese. 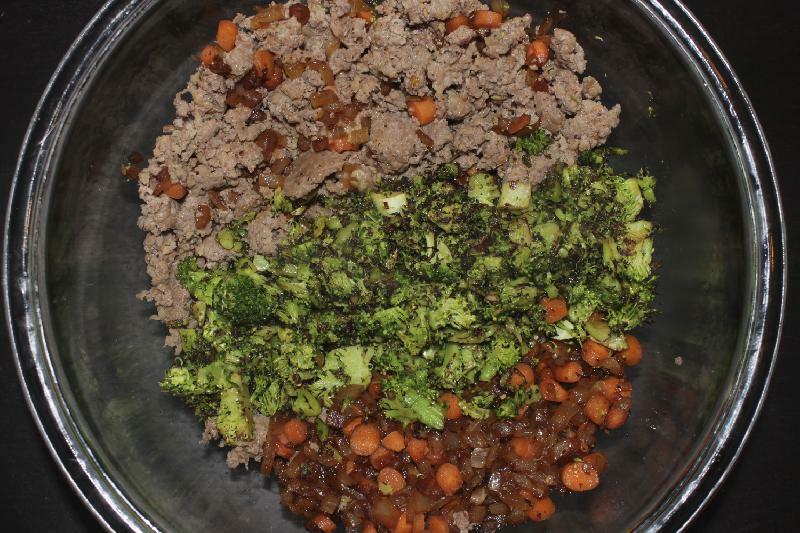 Specifically, I used Italian sausage, carrots, onions, and broccoli. I’ve had other quiches that worked well with zucchini, mushrooms, or spinach. The world is your quiche oyster! One thing to keep in mind is that the vegetables should be cooked, and cooked pretty soft. This will give a nice consistency with no odd crunches (unless you like that), and more importantly, prevent the veggies from creating watery spots. Frozen veggies also work; just be sure to thaw and drain well. You can also use a pie pan of any size. Just be aware that the potato crust will be thicker or thinner depending on the pan size, and you may end up with a shallower quiche or leftover filling. This recipe is extremely easy to double–in fact, I did so by accident in testing. I recommend doubling and having leftovers! I constructed this for breakfast, but we ate it for dinner the night I made it. You could easily make it vegetarian by replacing the sausage with more vegetables. And while I like mine as-is, Robby loves topping his with an array of hot sauces. Assisted by this recipe by Mommy Diva. Preheat oven to 400F. Grease a deep dish pie pan with cooking spray. Combine shredded potatoes, oil, salt, and pepper. Press into pie pan in an even layer, building the sides up as high as possible. Bake for 20 minutes, or until the edges are beginning to brown. Meanwhile, put a large saute pan over medium heat. Cook the sausage, crumbling it as you go, and set aside in a large bowl. Use remaining sausage grease or olive oil to saute carrots for about 5 minutes; add onion and saute another 5 minutes or so, or until everything is soft. Add these to the sausage. Saute the broccoli next until browning; add garlic and cook for another 30 seconds. Add to the sausage and veggie mix, along with 1/2 cup of the shredded cheese. Mix well. Spoon filling into the pie crust; press down gently if it doesn’t all fit. You may have a little left over. Beat eggs with milk. Pour over filling as evenly as possible. 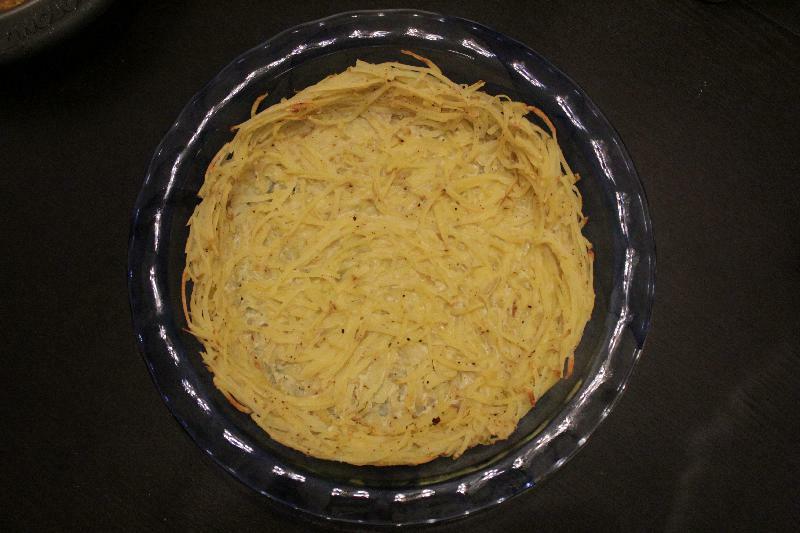 Top with the other 1/2 cup of cheese, and bake for 20 more minutes or until the center is set.